We haven’t lost Pinky yet – but I live in fear. My little one won’t sleep, eat or go anywhere without Pinky – and washing her is becoming a looming dread all week. She’s just learning to walk at 9 months old… and carries Pinky around in her mouth, hanging by his horns. I don’t know the brand, as it was bought in a big hit of items second hand, and I haven’t seen it anywhere else. The tag has faded away to nothing, but I looked carefully when I realized that Pinky might be “The One”. All it said was “made in China”. 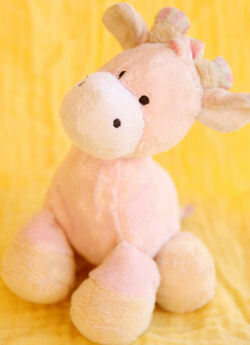 Pinky is a pink stuffed giraffe, about 7 inches from hoofs to tip. Her mane and tail are made of pink and white striped material, and the horns are tipped with the same fabric. She has big round feet. Thanks for your website, and I think what you’re doing is a very important job. I’ll keep my eyes out for the toys other people are searching for. Not sure, but that giraffe looks like a Ty Pluffie (the same company that makes Beanie Babies). Lots of places to buy them on line. I've gotten some for my kids on Ebay. Hope that helps you. I couldn't find any info about it online – but thanks for the heads up – If I'm ever in Clear Lake, Texas (I live in Australia so it'd be a big trip) – I'll look. Thanks!